One97 is a leading VAS provider offering products and services to meet the needs of all segments of the market ie. Telecom service providers, Consumers (i.e., mobile phone users), Enterprises worldwide. They have introduced a new online prepaid recharge site – Paytm. Few weeks back Paytm revealed its new version, and it is favored among users. During this period a lot of data gathered and it is analyzed. Results break many myths of e-commerce!. *Friends and Family give boost to Indian Online Commerce Business in India. * 40% of all recharge transactions on PayTM are done for friends and/or family and not for oneself. *Customers tend to recharge other mobiles almost as often as their own. Perhaps it is related to the Indian culture of doing something for others. 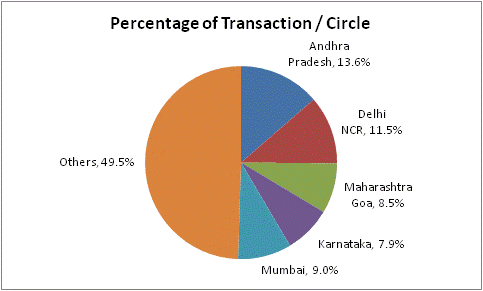 *The maximum transactions are not from Mumbai, Delhi, Chennai or Kolkata its from Andhra Pradesh, which appears to have been driven from Hyderabad. Delhi / NCR stands at number 2 followed by Maharashtra, Karnataka and Mumbai. *Chennai stands at No 12 and Kolkata at 16. Online Commerce is an exciting industry with a lot of space for customer centric services. There are some great initiatives soon to be launched by PayTM that we will keep you updated about!